Centuries ago, Greenport was a bustling whaling village by the bay, complete with fisheries and oyster processing plants. Today the North Fork is much quieter, but there is still so much going on. Far past the wineries and vineyards that sprawl across eastern Long Island is Greenport Harbor Brewing Co., the village of Greenport’s newest local flavor. Greenport Harbor Brewing Co. is Long Island’s newest microbrewery, but the idea behind the business is nowhere near new. Founders Rich Vandenburgh and John Liegey met in college and became best friends all through their schooling. As casual drinking buddies they began to discuss the idea of opening their own brewery. DJ Swanson, the head brewer at Greenport Harbor, pouring a growler of their beer. Some 20 years or so had passed and their college ambitions became a reality when Rich Vandenburgh saw Greenport’s old run-down fire department garage for sale and realized the opportunity in front of him. They decided the location was perfect because they wanted to open shop in a public area and they spent eight months personally making repairs to the shanty building. 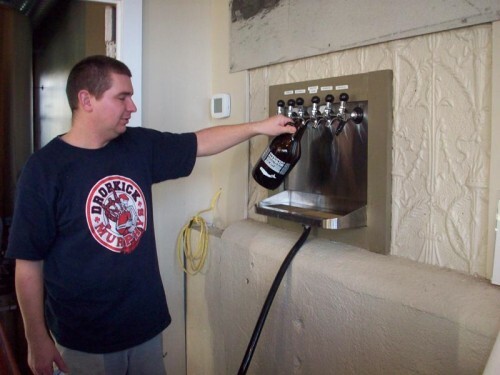 On July 17, 2009, Vandenburgh and Liegey hand-delivered Greenport Harbor Brewing’s first keg of craft beer to Jerry’s Crab Shack on a two-wheel dolly and the brewery was officially open. The newly-renovated building has an extremely nostalgic feel to it. The walls are covered with photos and artifacts from the building’s old days as home to the 1898 Star Hose and Eagle Hook and Ladder fire house. The tiny tasting room (complete with a bar that encompasses all of about nine square feet) allows for ample viewing directly into the brewing room at the breweries three fermenters and five beer vats. The tasting room also gives off a nostalgic vibe with carved wooden whale decorations on the walls, a throwback to the village’s humble seventeenth-century beginnings. The biggest room in the brewery is upstairs, where rentals are available for private parties and the walls are laden with local folk artist Candyce Brokaw’s visionary works. 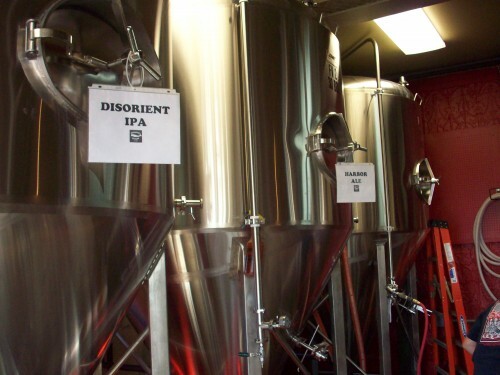 Self-distribution has become a major part of the brewery’s local success. Head brewer DJ Swanson said since they have not lined up a mass distributor as of yet, it is not unusual for kegs to be carried by hand across the street to local bars and restaurants. The brewery has plans to find a distributor to work with sometime in early 2010 in order to ship their beers out to Nassau County, Brooklyn and Manhattan, Swanson said. Every beer brewed in Greenport is made with Swanson’s recipes and he is the company’s only full-time employee. His rich background in brewing includes distilling vodka, making wine, and brewing beer at John Harvard’s Brew House. 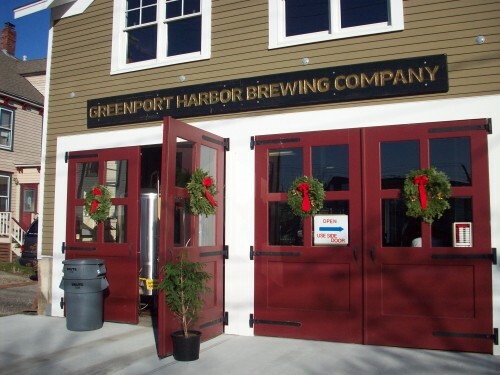 The tasting room at Greenport Harbor Brewing Co. offers samples of all five of Greenport’s craft beers: Harbor Ale, Disorient IPA, Black Duck Porter, their fall seasonal Leaf Pile Ale (a pumpkin-spiced ale), and Old Kennecott (and English old ale). Greenport Harbor’s Leaf Pile Ale is their biggest seller to date, Swanson told tasters enjoying the sweet amber ale. Swanson’s Old Yennecott, which is the Native American name for the North Fork, is the first of what he hopes will be “a series of one-off batches” that will be brewed as seasonal winter beers. Old Yennecott is a delightfully sweet and smooth English brown ale, highly reminiscent of London or southern-English-style brewing. “I’ve been known to be a little heavy-handed on the hops, so I had to make at least one less hoppy beer,” Swanson said about Old Yennecott. Aside from being an old whaling village, Greenport was also a major rum-running town during America’s prohibition era. Black Duck was the name of one of America’s most notorious rum-running boats and that is where Greenport got the name for its thick, chocolaty porter. “We wanted to do a porter because you don’t see porters as much anymore,” Swanson said. Although the porter is a dark brownish black with a thick, creamy head, Swanson swears that is no reason to be misled. “Just because a beer looks like a Guinness, doesn’t mean it tastes like one.” In this case Swanson is correct, as the Black Duck porter is more carbonated than Guinness Stout but is definitely sweeter and lighter than Ireland’s famous export. On an average afternoon Swanson is the only person working at Greenport’s brewery, but he says he gets no greater pleasure than seeing people return with their growlers for refills. All day long people window shopping and bar hopping in the vivacious streets of Greenport Village curiously stop into the brewery to see just what is going on inside and Swanson is happy to give anyone a tour of the renovated building. Most people are pleasantly surprised to see their little village now hosts its own brewery and Greenport Harbor Brewing Co. has even developed a little base of regulars within the town. “We are the friendly neighborhood brewery,” Swanson said.